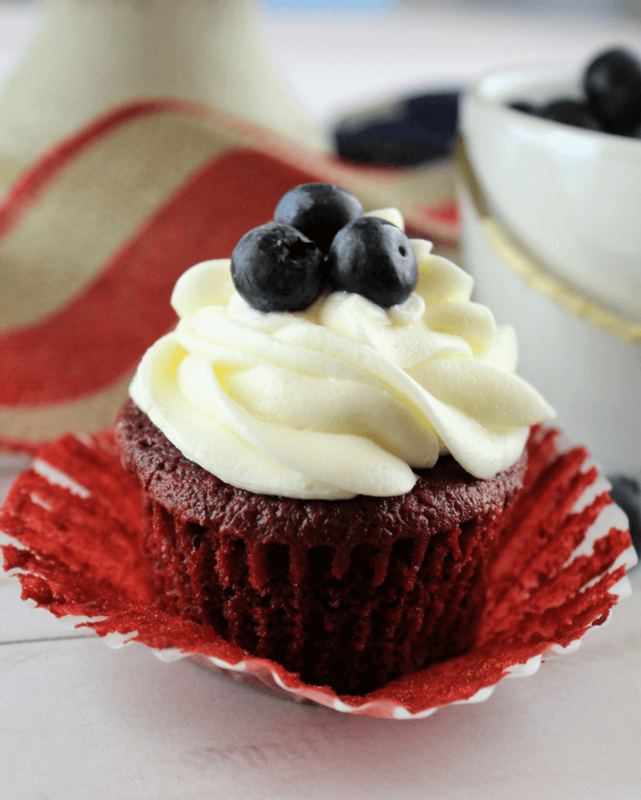 Red, White and Blueberry Cupcakes with red velvet cake, cream cheese frosting, fresh blueberry garnish and a cream cheese with blueberry surprise center. I love when I have an idea in my head and it all just comes together beautifully. 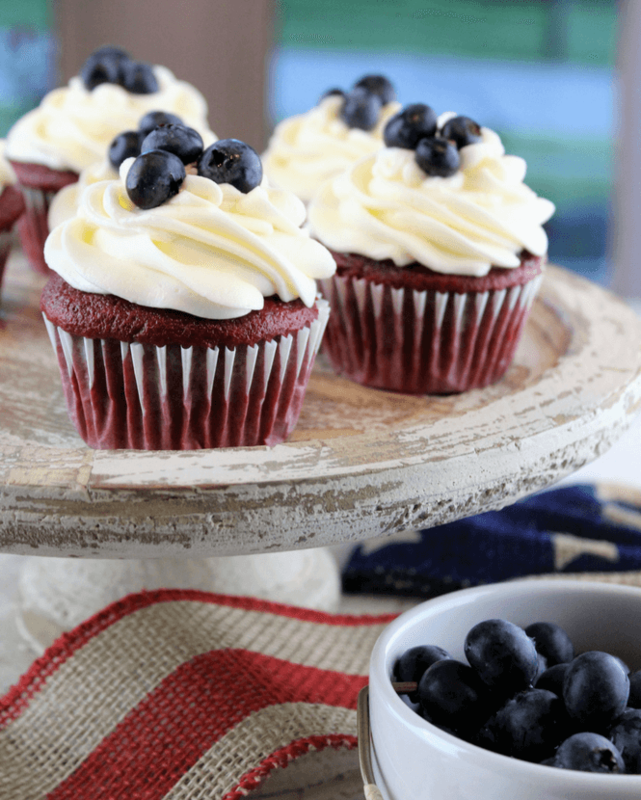 I wanted to create a red, white and blue dessert that didn’t scream July 4th with flags sticking out or anything over the top. 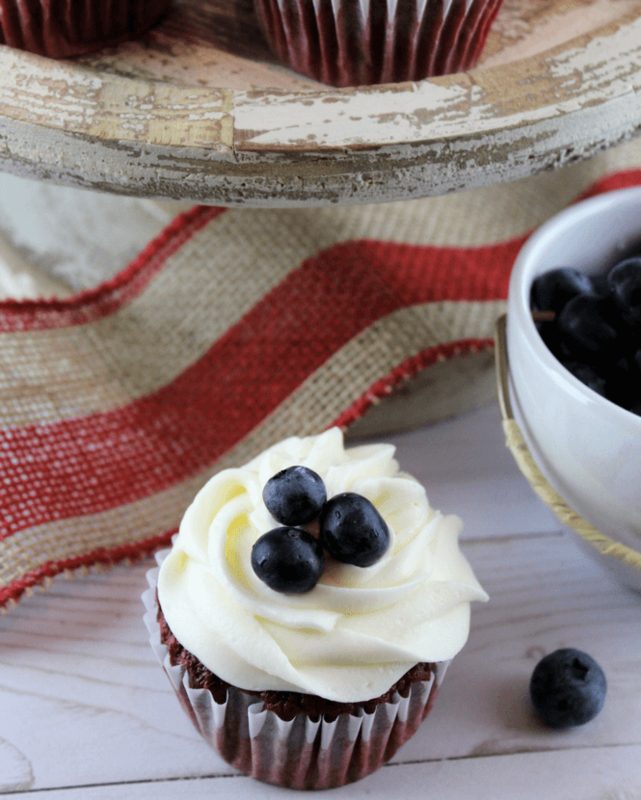 This dessert will work anytime of year but extra special for holidays like Memorial Day, 4th of July, Labor Day, Veteran’s Day and more. 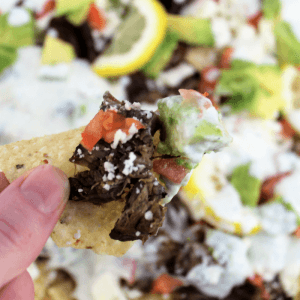 It will add a little more sophistication to a neighborhood grill out or celebration without spending hours in the kitchen. Red velvet cake and no extra work? Wait, what? If you have made a red velvet cake or two in your life, then you understand how it takes a little extra time and effort to make a red velvet cake. I actually made this recipe twice. The first time I made a red velvet cake from scratch. The cupcakes turned out amazing but this is Simply Made Recipes, not I Love Being in the Kitchen for 10 Hours Baking All Day. With that said, these cupcakes are from a box mix with a few extra ingredients added. 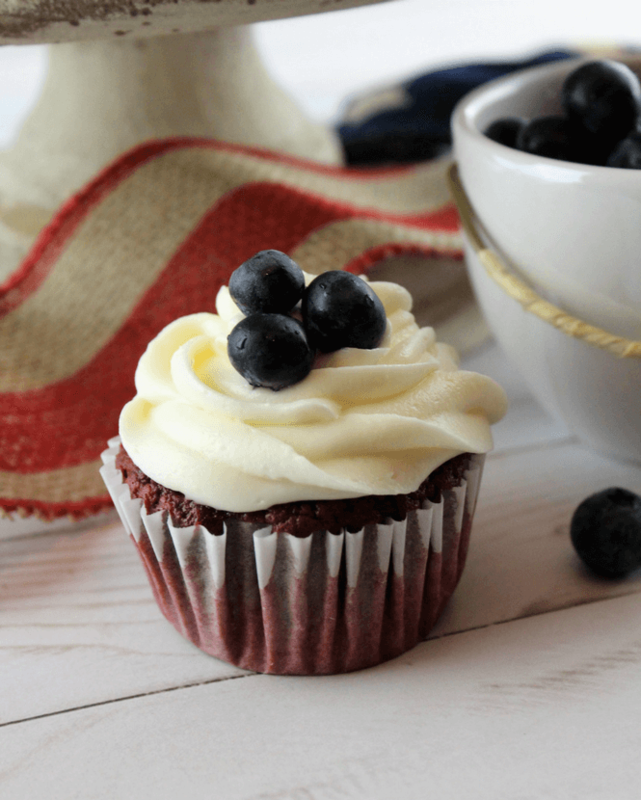 I had these Red, White and Blueberry Cupcakes completed start to last blueberry garnish in about an hour. Boo-yah! 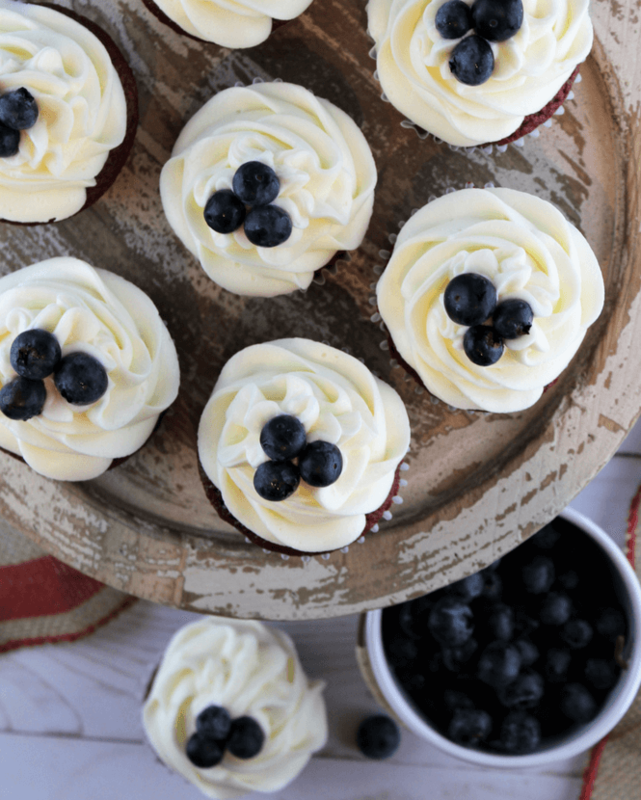 I whipped up a really simple cream cheese and blueberry filling for the center of the cupcakes that is optional. The filling adds a little extra flavor and fun little surprise! However, these cupcakes would be absolutely perfect without. So, if you are iffy about the filling, leave it out. No problem. Use buttermilk instead of just water. Add a packet of instant pudding. I used the red velvet pudding mix but chocolate would also work great. Add a pinch of white vinegar. 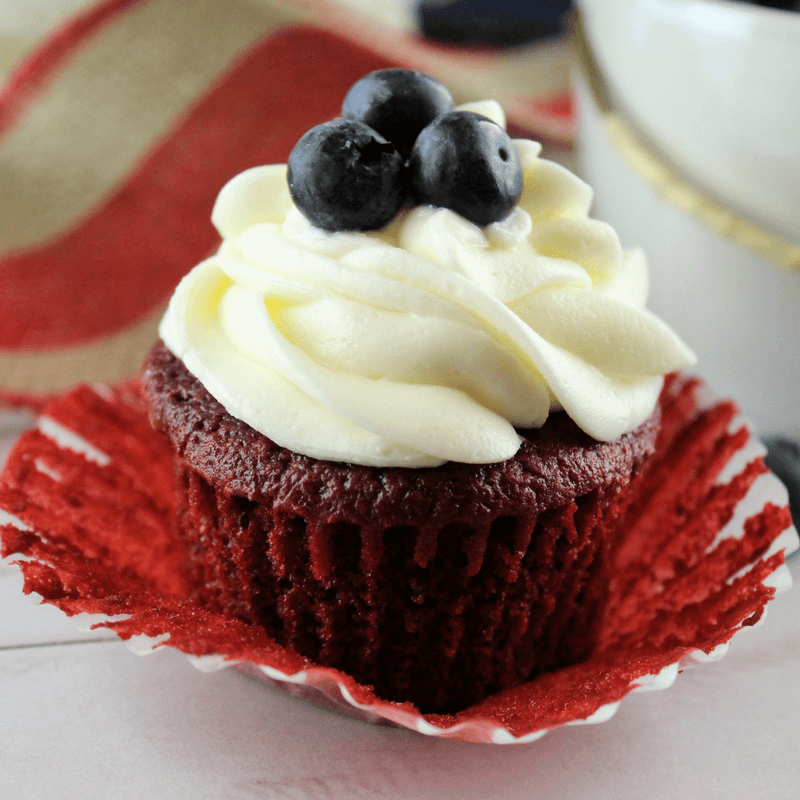 I had to make a cream cheese frosting to pair with the red velvet because the two are just meant for each other. Cream cheese frosting is probably the easiest frosting to make. Take 8 ounces of cream cheese and a stick of butter. Blend the two with a hand mixer until nice and creamy. Then add in your confectioners sugar and vanilla extract and blend until it has a nice thick consistency. Add in a cup at a time of the confectioners sugar until the frosting is just right. You know it is done when you can take a spoonful and tip it upside down without it budging. You want it to be thick and stand up. Any tip can be used for decorating. With cupcakes, I prefer the large or extra large frosting tips because they make the cupcakes look really pretty and full. Add a few fresh blueberries on top to finish of the look. Mixing bowl #1: Prepare your cake batter. 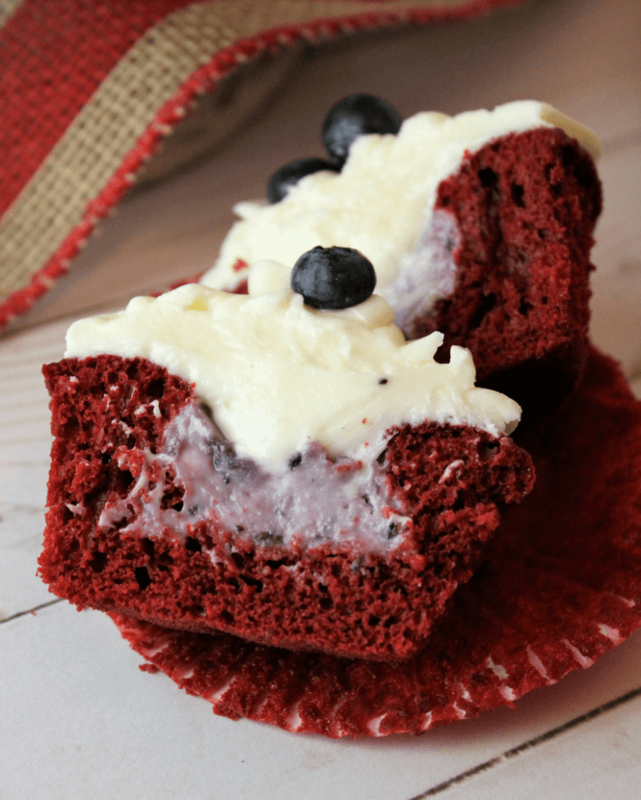 Use a hand mixer or stand mixer to blend 1 box red velvet cake mix, 4 eggs, 5 tablespoons butter, 1 packet instant pudding), 1 cup buttermilk, and 1 teaspoon white vinegar. The batter will be somewhat thick. Mixing bowl #2: Prepare the blueberry cream cheese filling. Use your hand mixer to blend the 8 ounces cream cheese, 3 tablespoons blueberry preserve and 3 tablespoons sugar until creamy. Prepare your muffin trays with cupcake liners. I used white and a red and white polka dot pattern. Pick something festive or simple. 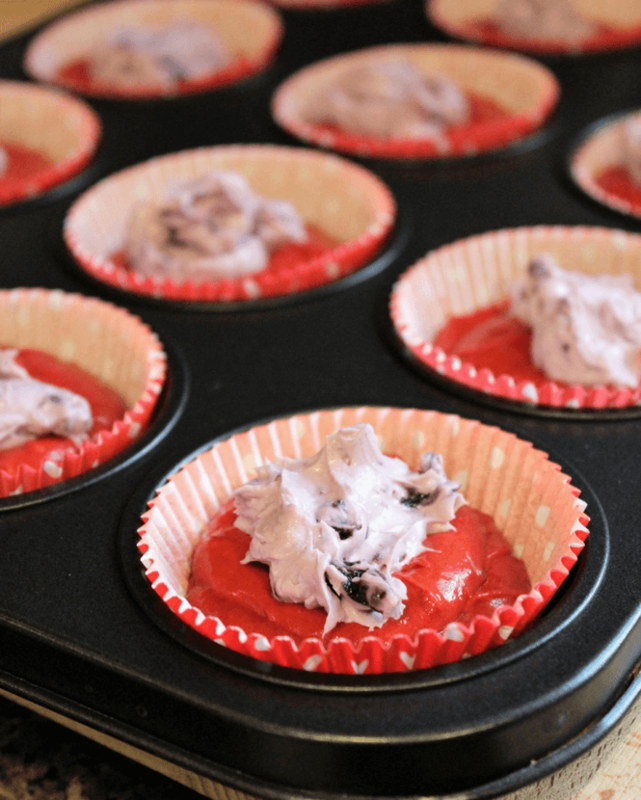 Fill each cupcake liner half way with red velvet batter. Use a spoon to put a dab of cream cheese filling on top and centered. Mixing bowl #3: Prepare the cream cheese frosting. Use the hand mixer to blend 8 ounces of cream cheese and .5 cup butter until creamy. Add vanilla extract and 1 cup at a time of confectioners sugar. Blend and add the confectioners sugar slowly until at a nice, creamy, thick consistency. 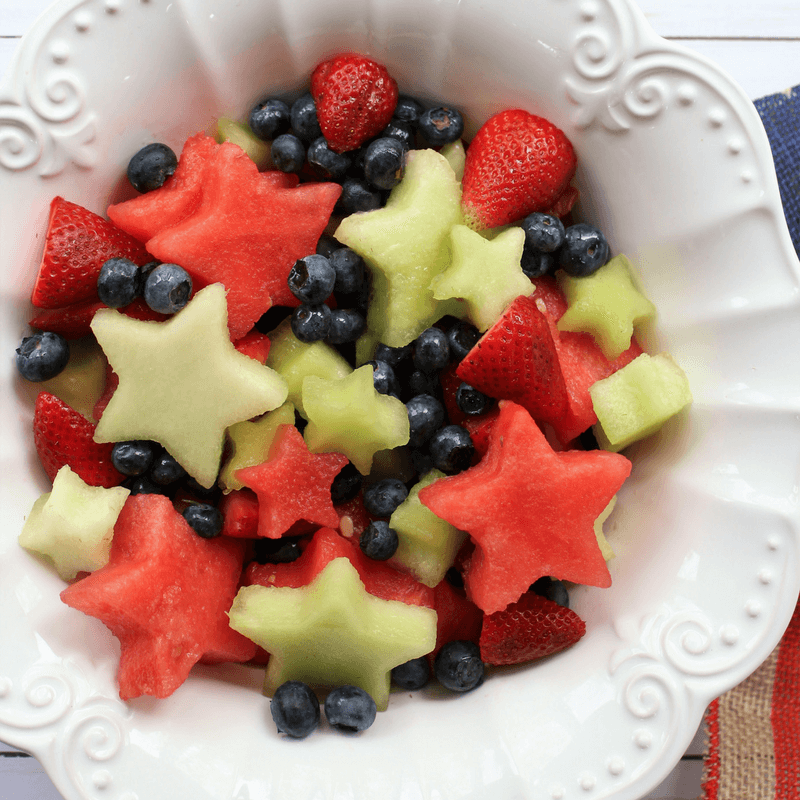 Fruit Salad with Lemon Maple Dressing has fresh strawberries, blueberries, watermelon and honeydew melon star cut outs with a simple maple syrup and lemon juice dressing. 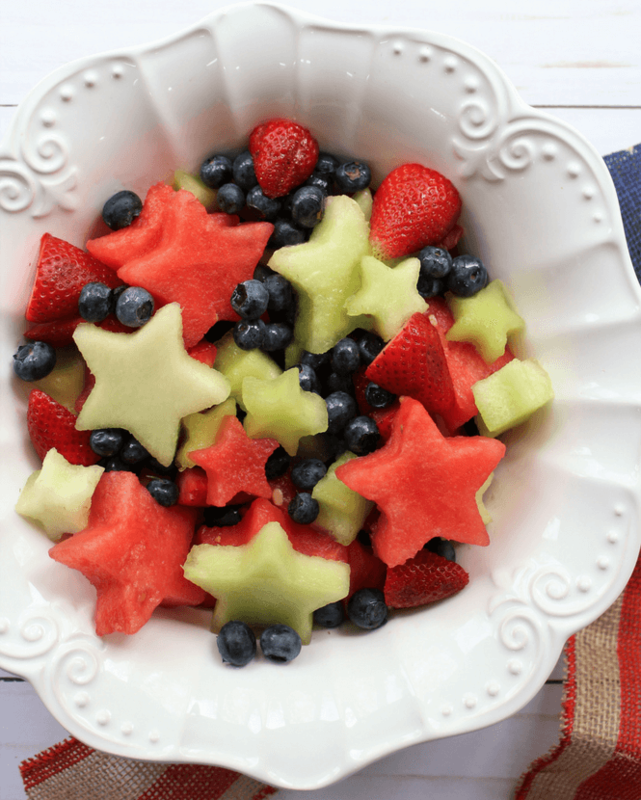 The star cut outs make this healthy side dish fun and patriotic that is perfect for holiday BBQ’s. I enjoy making side dishes for family get togethers or neighborhood parties. I prefer to keep it simple when feeding a lot of people so everyone can dig in and enjoy. Fancy or complicated dishes can be confusing to some people and sometimes kids are weird about trying anything unfamiliar. Fruit Salad with Lemon Maple Dressing is one of those side dishes that will please everyone and does not take a lot of your time to put together. 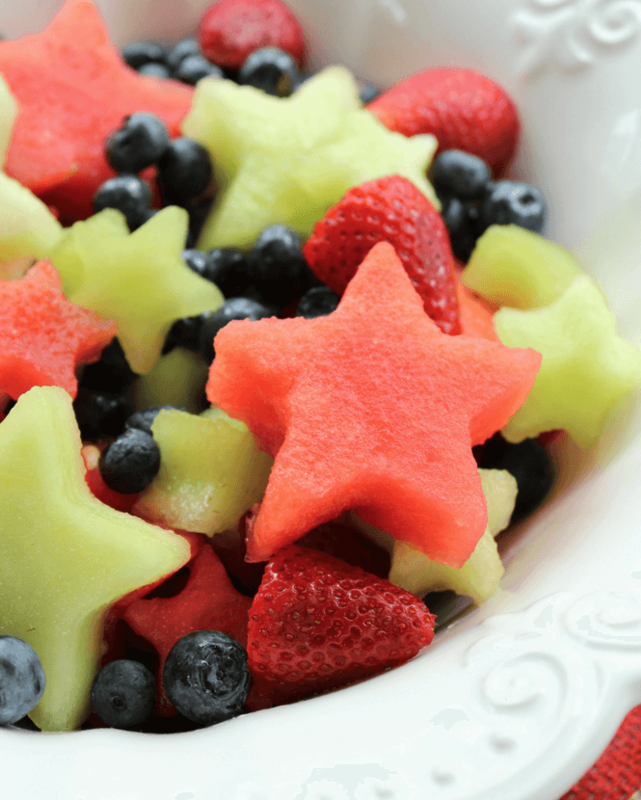 The fun part of this dish is the star shaped fruit. I bought a pack of star cookie cutters in multiple sizes and sliced the melons in about 1 inch sections. Then, used the different sized stars to make the cut outs. Really simple but adds a lot to the dish. Kids always think it is fun and want to eat all the stars. You will have some scraps left over from the melons. I just cut those into little bite size pieces and toss into a separate bowl for snacking. With my Fruit Salad with Lemon Maple Dressing in hand, I am ready for all the summer grill outs we will be attending or hosting. So fresh, easy, healthy and a complete crowd pleasure that happens to also be budget friendly and shows a little creativity. Wash your berries well and dry. Cut strawberries in half and toss in a large bowl. Slice half a watermelon and half the honeydew melon into 1 inch pieces. 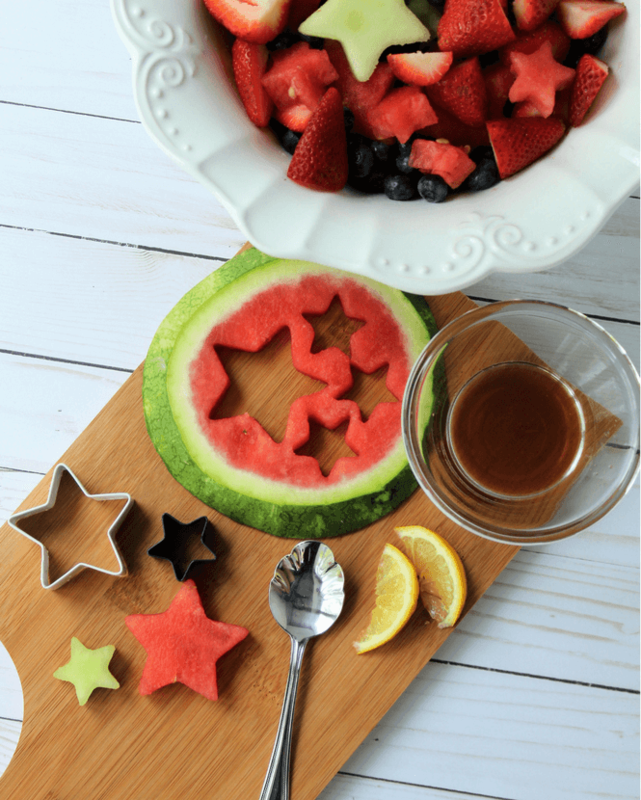 Take your star cookie cutters and press into melon creating your stars. 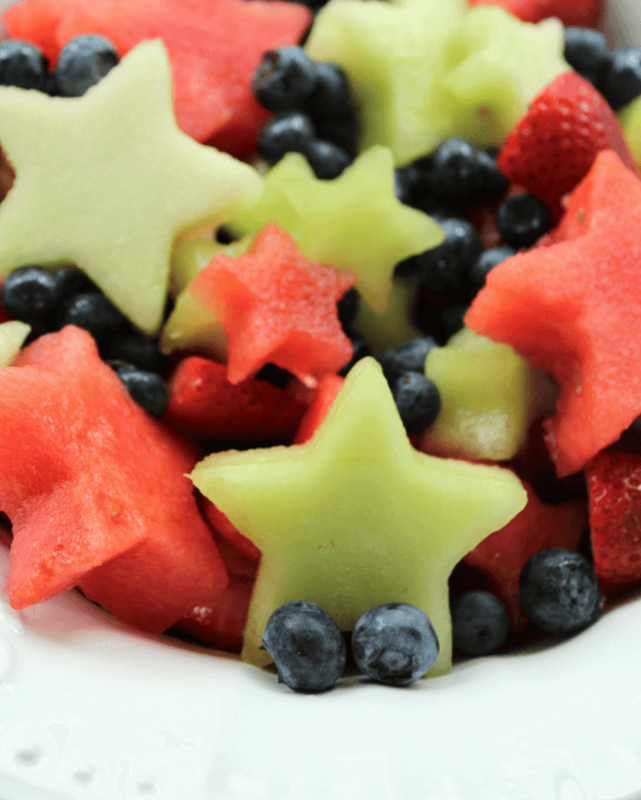 Toss stars into bowl. Mix 1/4 cup maple syrup and squeeze 1 fresh lime into a small maple. Mix well and pour over top of fruit. Simply Made Recipes is an affiliate of Amazon Associates LLC. If you click on a link and make a purchase, we may receive a small commission from the sale. This costs nothing extra for you and helps keep Simply Made Recipes up and running. Thank you for your support!